Even with the cold winter still in full force, hunters are starting to receive those “Spring Turkey” edition catalogs from outdoor retailers. Looking at the vast array of new calls and equipment makes turkey hunters long for that morning sunrise in the woods. Sometimes, the number of turkey calls offered is overwhelming. Do I need a new call to bring a gobbler in this year? What sound improvements do I need to make? Which new call will be my answer? Some years ago an expert duck caller was interviewed about how he improves his calling sounds. His answer: listen to the birds and imitate them. The same holds true for turkeys. 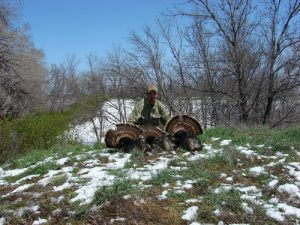 In late winter, the turkeys are still bunched up. Taking time to listen to the sounds they make can help a hunter understand the nuances of their communication. The volume and pitch of a real, live turkey is so much more helpful than the sketchy, skewed noise found on turkey hunting DVDs or on turkey calling shows. What better teacher is there than Mother Nature? So, while out walking the woods for antler sheds, stop, look and listen for those wild turkeys. Take a call along and imitate their sounds. A conversation might ensue. Tell the Toms that you’ll be back in a few weeks.